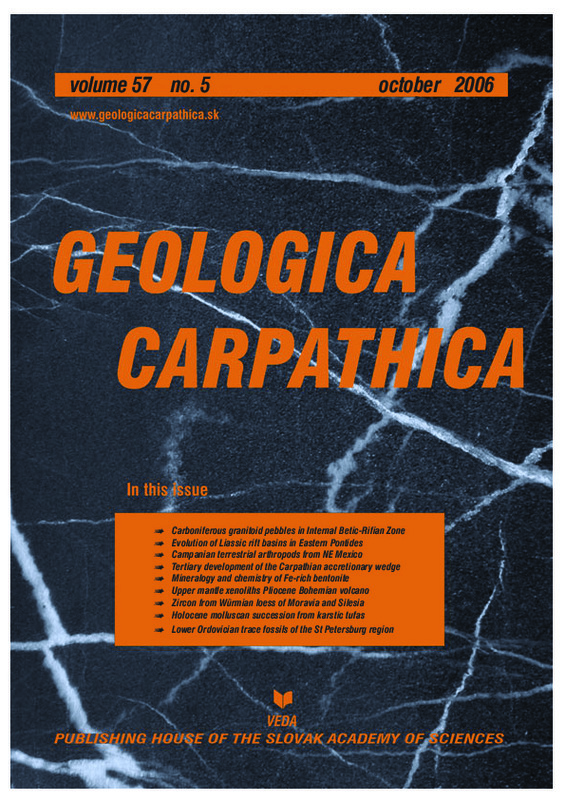 Abstract: An outcrop of Carboniferous conglomerates is described in the Malaguide-Ghomaride Complex in Ceuta, comparable to the Conglomerate Formation of Marbella. Granite cobbles and pebbles belonging to deformed peraluminous granites from epizonal massifs are significantly present within the conglomerates studied. Granites with these characteristics abound in the Central Iberian and Western Asturian-Leonese Zones and differ from those predominating in the Ossa-Morena and South Portuguese Zones of the Iberian Massif, geographically nearest the current Malaguide outcrop. This suggests that the Malaguide-Ghomaride Domain was originally situated towards the east, thus forming the prolongation of the Central Iberian or Western Asturian-Leonese Zones. This paleogeographical hypothesis is also confirmed by stratigraphic comparisons indicating close similarities between the Devonian and Carboniferous series of the Malaguide and of the more distant Minorca or Catalonian Coastal Range, as well as clear differences with the successions of the South Portuguese and Ossa-Morena Zones. Furthermore, the correspondence of the Malaguide-Ghomaride Domain towards the south with the Moroccan Meseta is also discussed. The nature of the granite cobbles of the Malaguide is a new argument that supports the contention of its westward shift of hundreds of kilometers during the Early Miocene, then forming the Gibraltar Arc and occupying its present-day position. Abstract: The Eastern Pontide magmatic arc (NE Turkey) was rifted by the polyphase extensional tectonic regimes in the Early Jurassic. While alternated volcanics and siliciclastic sedimentary rocks accumulated during the episodic tectonic subsidences, thermal subsidence is manifested by sedimentation of the red pelagic limestones of the Ammonitico Rosso during the Pliensbachian. The trends of the Liassic basins extending in NW-SE, E-W, NE-SW directions coincide with the gravity and magnetic lineament anomalies and corresponding fault zones that are responsible for the paleotectonic and neotectonic evolutions of the Eastern Pontide magmatic arc. These mutual relationships suggest that the faults making up the architecture of the Liassic basins might have operated during the Paleozoic, Mesozoic and Cenozoic times in different manners. Neptunian dikes, filled by the early rift siliciclastic and following fossiliferous red pelagic limestone implying the repeated extensional tectonic regimes, are also parallel to the main extensions of the Liassic basins. The poles of the contemporaneous neptunian dikes suggesting two or three extensional conjugate fracture systems are in accordance with the dip directions of the rift sediments accumulated in the same conjugate normal fault systems. Assuming that the Liassic basins with Ammonitico Rosso are coeval, multi-armed rift basins might have opened by the mode of the three-directional extension rather than reactivation of faults in the different times. Abstract: The Campanian assemblage of arthropods from the Cerro del Pueblo Formation in northeastern Mexico display some primitive characteristics. It consists of a small spider, a dragonfly assigned to the Libelluloidea, and cockroach Xonpepetla rinconensis Cifuentes-Ruiz et Vrsansky gen. et sp. nov. The last represents the latest record of the family Blattulidae and appears to be derived from the Aptian or Albian Cretaceous cockroaches of the genus Elisama Giebel, 1856 from the Crato Formation, Brazil. Abstract: During Eocene–Sarmatian, a Polish-eastern Slovak portion of the Outer West Carpathian accretionary wedge was deformed in front of the ALCAPA terrane. This portion advanced into the area of the subducting remnant Carpathian Flysch Basin, a large oceanic tract left in front of the Alpine orogen. Western parts of the wedge were characterized by a noticeable lack of involvement of thick-skin thrusting and by a predominant development of fault-propagation folds. Eastern parts of the wedge were characterized by the involvement of thick-skin thrusting, triangle zones and back-thrusts. The frontal portion of the wedge was characterized by a decollement formed along the shale and gypsum formations of the Badenian molasse sediments, which resulted in the increased width of the thrust sheets. Forelandward thinning of foreland basin sediments indicates that the portion of the European Platform attached to the subducting oceanic lithosphere flexed underneath the advancing Carpathians as early as the Eocene. Oligocene sediments record syn-depositional thrusting by abrupt thickness changes over short distances. Younger periods of the thrusting are documented by the Eggenburgian–Karpatian piggy-back basin carried by thrust sheets in the frontal portion of the ALCAPA terrane, the Early Miocene age of the youngest sediments in the central portion of the wedge and involvement of the middle Badenian molasse sediments in the frontal portion of the wedge. The end of the shortening is documented by the lower Sarmatian end of the strike-slip fault activity behind the wedge, by the middle Sarmatian transgression over the deformed wedge in the Orava-Nowy Targ Basin, which is located in the rear portion of the wedge, and by the Sarmatian undeformed sediments sealing the wedge front. The existence of the forebulge in front of the advancing Carpathians is documented by local Eocene, Oligocene and Lower Miocene unconformities in the frontal portion of the wedge. Abstract: Powder X-ray diffraction and infrared spectroscopy were used to identify the mineralogical composition of clay obtained from a systematically sampled bentonite deposit at Lieskovec (Central Slovakia), developed from andesitic pyroclastics. The main mineral is an iron-rich montmorillonite, the admixtures present in all samples include kaolinite, quartz, cristobalite and plagioclase, while muscovite/illite and orthoclase appear in most samples. This bentonite deposit is relatively homogeneous as is demonstrated by its chemical composition and quantitative analysis using Rietveld refinement. Total Fe2O3 content (5–9 %) in the Lieskovec samples is higher than in most other Slovak bentonites. Mössbauer spectroscopy shows that Fe(II) covers less than 5 % of total Fe. Goethite and/or hematite are not present in all <2 mm fractions separated from the raw bentonite and they contain up to 26 % of total Fe. Low tetrahedral Al and octahedral Mg substitutions cause that the smectite is of lower charge than montmorillonite separated from the best known Slovak bentonite: Stara Kremnicka-Jelsovy potok. This is in accord with the absence of the AlMgOH bending vibration in the IR spectra of Lieskovec samples. Abstract: Upper mantle xenoliths are abundant in the basanites of the Pliocene Kozakov volcano. The studied samples of spinel lherzolites come from the depth of about 50–75 km. Their mineral assemblage preserved subsolidus temperatures of 1165–1052 ºC from the time of xenolith entrapment. Oxygen fugacity varies from +0.14 to +0.93 log unit relative to fayalite-magnetite-quartz (FMQ) buffer. Major bulk-rock oxides and variations in mineral chemistry indicate a continual depletion trend mainly associated with extraction of basaltic melt from the mantle. Mineralogical features and the absence of highly oxidized lherzolites suggest a negligible degree of modal metasomatic overprint. On the contrary, the LREE upward patterns and U-shaped REE patterns of clinopyroxenes, as well as of the bulk lherzolite compositions are indicators of cryptic metasomatic event(s) in the upper mantle. The U-shape REE patterns corroborates to enrichment mechanisms in the mantle by reactive porous flow and chromatographic fractionation. A possible cryptic metasomatic event(s) could have occurred in pre-Cenozoic times, probably during the Variscan orogeny. Abstract: A detailed zircon study (typology and cathodoluminiscence) of late Pleistocene (Würmian) loess sediments from Moravia area, Czech Republic shows a significant western provenance from magmatic (mainly granitic) rocks of Bohemian Massif together with contributions from metamorphic rocks. Zircon typology is applicable only for well-preserved magmatic zircon crystals, which usually occupy a part of the whole zircon population. Zircon typology indicates a dominant provenance from calc-alkaline I-type granites, whereas important contributions of material from S-type granites (Moldanubian pluton?) is not documented. The provenance material of the Velka Bites locality is derived from the adjacent melanosyenitic rocks (durbachites) of the Trebic Massif and in this case confirms transport over a short distance as well as provenance from the west. Cathodoluminiscence images indicate both magmatic and metamorphic origin of the studied zircon. Abstract: A detailed molluscan succession from Holocene calcareous tufa deposits at the Kotyz Ridge and in the Cisarska Gorge in the Czech Karst provides the most complete record from central Bohemia. The succession has been reconstructed from three profiles and chronology provided by AMS radiocarbon dating of charcoal and dating of carbonate by the U-series method. The early Holocene malacofaunas represented by occurrences of index species Discus ruderatus, accompanied by other boreo-montane elements (Vertigo substriata, Vertigo alpestris, Perpolita petronella), dominate in the earliest phases of tufa formation that is dated by the U-series method to 9460±1200 years BP and 5920±1520 years BP in the Cisa?ska Gorge, or before the interval 5070–4800 years BC at the Kotyz Ridge. The change in composition of molluscan assemblages follows in the form of total replacement to Holocene Climatic Optimum (Atlantic, Epiatlantic) malacofaunas, consisting of several indicative elements (e.g. Bulgarica cana, Truncatellina claustralis), which are extinct or relatively rare in that region today, and even in the Czech Republic as well. The youngest phases of molluscan successions are represented by the accession of modern immigrants Xerolenta obvia and Oxychilus cellarius, never documented before from the Subboreal period in this region. Abstract: The basal layers of the Leetse Formation (Lower Ordovician, St Petersburg region, Russia) are characterized ichnologically by: 1 — local occurrence of the ichnogenera Conichnus, Bergaueria and ?Thalassinoides at the base. These traces originated by burrowing in consolidated substrate of the underlying black, clayey Dictyonema Shale and were buried by the basal bed of the Leetse Formation; 2 — the layer with camerate burrows (Amphorichnus div. isp. ), filled with phosphatic substrates, ca 15 cm above the base. Considering the position of the localities of the phosphatized burrows in the basin, we presume that burrows on tops of tectonically uplifted blocks were filled by cryptocrystalline phosphorite matter. Rapid phosphate mineralization points to conditions of shallow burial, high concentration of dissolved pore water phosphate, and suitable redox interval caused by decomposition of organic matter of burrow dweller tissues.